About a week ago I had a heart-to-heart with myself about running, or I guess I should say a head-to-heart since it was just a bunch of thoughts swirling around my mind during a long run. Over the last two and a half years I’ve been so focused on the marathon that I haven’t paid much attention at all to the other distances. My last PR was the half marathon (2:57) way back in January 2015 and I haven’t PR’d in the 5K (37:57) since December 2014. I miss racing. A lot. Having the goal of running a 5:59 marathon doesn’t feel like racing to me. A lot of stuff can happen during the course of six hours that feels outside of my control. Six hours is a long time. I’m not saying six hours isn’t a respectable goal for someone with my running capabilities, I’m really just saying that it doesn’t excite me. The last thing I want this year is for February to roll around and for me to feel like I had another bad season. I didn’t run any PRs last year – most of my races were FAR OFF from my PRs – and that just didn’t feel good. I know that not every season or year will bring around a PR, but I want to feel like I’m at least chasing one, quite literally. Over the course of the last week I have been going back-and-forth about whether I should just run the Miami Marathon and focus on the half marathon for the 2017 season – or if I should drop to the half at Miami. After seeing everyone run Chicago I felt a bit of a spark for the marathon distance, but that’s waned over the last few days again. It especially waned after walking into my new house last weekend and realizing that Adam and I have a lot of work ahead of us. We’re tentatively hoping to be done with all renovations by the first or second weekend in December, but we’ll be working on the house every single weekend until then (with the exception of our anniversary weekend). The cost of renovations is going to be quite high, so we’re trying to do many things ourselves to stay within budget. Because we’ll need to work on the house every chance possible on Saturdays and Sundays there isn’t going to be a lot of time for 18 and 20 mile runs. At my easy/long run pace an 18 miler would take me 4.5 hours and a 20-miler would take me 5 hours. Getting up at 3am to be out the door by 4am so I could run for 5 hours before jumping straight into working on the house for 8 hours would kill me. I’d collapse from exhaustion before the race even came around. All the signs seem to be pointing me towards dropping to the half marathon — and that’s actually what I WANT to do. So, that’s what I’ve decided to do! 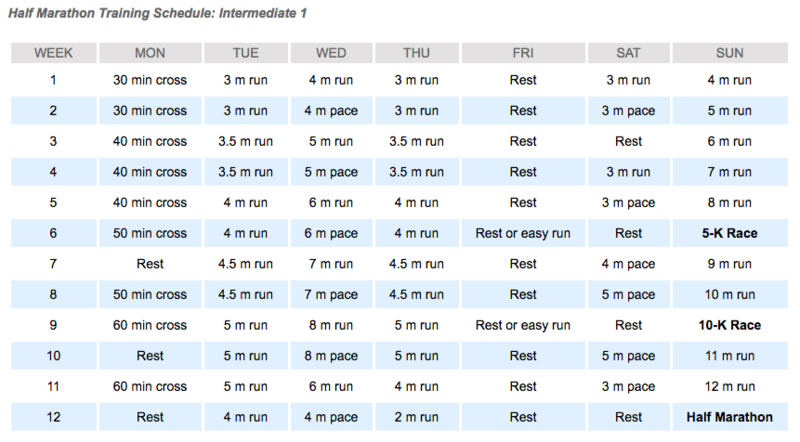 I made the final decision Sunday night and re-tooled my plan so that it’s now a 15 week half marathon training plan. It’s mostly based on the Hal Higdon Intermediate 1 Half Marathon plan. The plan as originally created tops out at only about 30 miles per week, and I’d like to run closer to 35 to 40 miles per week so I’ve added a mile or two to several of the runs to bring my total weekly mileage up a bit. I also stretched the plan from 12 weeks to 15 weeks (since that’s what I have to work with) which will allow me to sneak in a 13 and 14 mile training run instead of only doing one 12 miler. I’m not entirely sure what my goal finish time is yet… that’s TBD soon! Guys, I’m really happy about this. I am excited about this training cycle, the way it fits into my schedule through the end of the year and the type of goals that I’ll get to set. If you read through this really long post thank you very much! What kind of conversations do you have with yourself during long runs? Are you starting to think about 2017 plans/goals or are you laser focused on 2016? Previous Post A Quick Hello! This sounds great! I feel like I can sense your excitement through your post. I am just trying to get through 2016 before I start to really think about next year. I figure I won’t want to race until the spring so that gives me some time to very slowly build up my mileage and decide whats next. That sounds like a great plan for you! I am so inspired by all the PT work you’ve been putting in. Your next training cycle is going to feel great! Good for you for making this decision. The whole point of training for a race is enjoying the idea of working towards a goal. If it’s really an unrealistic burden then you’re probably setting yourself up for failure. Something similar happened to me when I was training for my triathlon. I originally planned on racing in July but I was also trying to relocate to Charlotte and drive an hour back and forth. I decided to switch races to September and it worked out so much better. Good luck with your training! Thanks Sam! It’s funny because when other people make changes in the middle of a training cycle I’m like “good for you, that totally makes sense” but when it comes time for me to make changes in the middle of my own training cycle I’m like “you’re ridiculous for doing this!” Why is it that we can see reason for other people but not ourselves! I’m not sure if I’ve ever commented here before but this post really resonated with me. I’ve done a number of half marathons and did my first marathon this year… My half marathon PR is still the first one I ever did, four years ago. I think I was so scared that I trained really well, but once the distance was less intimidating I was running more for fun. Ditto for the 10k distance. It seems easy to focus on those longer distances but I also made the decision very recently to take a step back and focus on a PR in the 5k and 10k. And gosh, you dealing with all those renovations? You’d be exhausted ALL the time, mentally and physically. You gotta take care of yourself! “oh, you’re running the half? That’s OK” haha 😉 I think that’s a great idea! I’ve spent the last three years beating myself up with Spring and Fall marathons and this past year has just wiped me out. Spent so much money on getting better, and training, and missing goals. Not fun. So yep, I’m adjusting my plans for 2017 to be a “better” year. Looking at some different goals that will bring back the fun and sense of accomplishment. That’s what we’re all in it for anyways, right? House projects take a lot of energy. It sounds like you are happy with your decision! I look forward to half training posts, and home updates! I’m so glad you found the right answer for your situation. My race goal for 2017 is to run my second marathon! I’m really excited about it. P.S. It is nice to find someone who has similar PR’s (6 hrs 20 mins marathon, 2 hrs 45 min half). I’m sort of considering a race in January, so I guess technically that is 2017, but all of the training will be in 2016. Beyond that, I haven’t really though of any 2017 goals. I’ll probably be doing some halves in the spring, but I also love racing a few 5ks in the spring. Haven’t decided yet. This plan seems like a really good fit for you. Built in cross training days for strength training, something Hanson’s really didn’t have time for. Plus I think the pace runs will help with confidence come race day. Especially the 7-8 mile ones. I think I maxed out around 6 miles at goal pace during my fall training and I think the race would have had a stronger finish if I had made it up to 8. Ah well, next time! Sounds like a great decision and I can tell how excited you are. I’ve been toying around with what I want to focus on for the first half of next year (half or full half or full). The remainder of this year is getting the foot healed up so no racing races, just walking or run/walking. GOOD!!! I am glad you are happy with your decision and you know in your heart AND your head what is right for you. I often base my training around Hal Higdon! Like when I have no idea what to do, I look at him for a reference! Kristina, I’m glad you’ve found an option that makes you happier and lifts some weight off your shoulders. It’s not easy to opt out of a training cycle or goal you’ve already sunk so much time and effort (and money) into – believe me, I know this, as I just made a similar decision myself. I think a lot of people in the running world pressure themselves into doing marathons because they feel like they have to keep up with the Jonses or be a “real runner”, but the marathon is something you should only do if you really want to. My 2016 year of training is pretty much done now. My only big focus for 2017 is the Chicago Marathon next fall. I’m very excited! I will probably run a few races here and there, but my focus in the spring will just be on running for fun and taking a long, much-needed break from structured training and goal races. I am happy for you!! Just moving and doing the kind of work you are talking about takes a lot of energy! Trying to marathon train through it, would deplete you. This is a good call and i think you can start working on making a new PR 🙂 Training this time of year should feel a little better than training in the dead of summer right. I hope you get that feeling back! I am cheering for you. So proud of you, but I don’t want you to think that successful seasons are based on accomplishments. 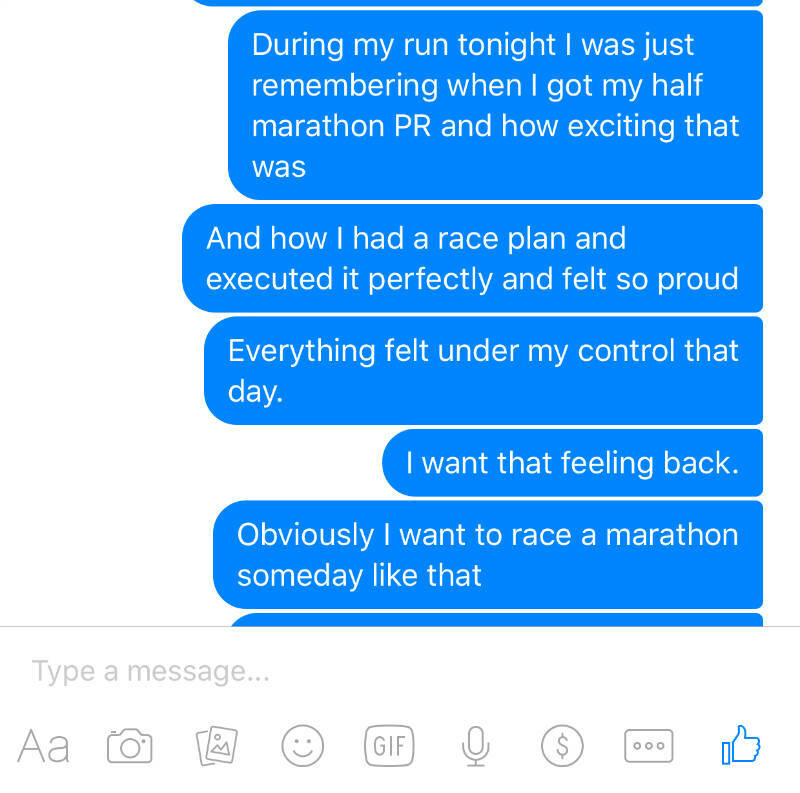 Remember why we do this, running provides us so much more than PR’s and time goals. You inspire so many people through all that you do. Trust me, you always have Successful seasons and all of us support you 100% in,ali the goals and plans you have.